Xcode even includes a refactoring called Convert to Modern Objective-C Syntax that will help you convert most of your code to this newer format. Fantastic I think! Easier to write, easy to read, and a very consistent and familiar way to access data by subscript. However, there is no built in refactoring in Xcode to change your old DADataTableRow code to this new format. Stuck doing this by hand? I think not! You can migrate your code to the newer syntax using Xcode’s Find & Replace. The Find & Replace in Xcode supports two powerful features we’ll use here: Regular Expresion (Regex) patterns and being able to preview and reject changes one-by-one. To get started, load up your project in Xcode. On the left, select the Search Navigator (or press ⌘3). At the top of the Navigator, select Replace if Find is selected. Click the magnifying glass with the down arrow to the left of the search box and click Show Find Options. Under Style, select Regular Expression. Click the Preview button to preview changes first. You can use the sliders in the middle of the preview window to accept and reject individual changes. Once you’ve reviewed the changes, click Replace and you’re done! 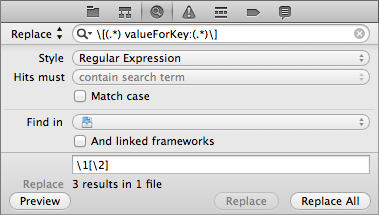 I’m happy any time I can use Regular Expressions without ending up with more problems than I started with. This entry was posted in Development, RemObjects, Xcode on November 28, 2012 by Nathanial Woolls (Nate).